RSPCA inspectors found more than 550 live gerbils when they raided a one-bedroom bungalow. They were being kept in cages, tanks, wine boxes and washing up bowls stacked more than six feet high in the house in Portsmouth, Hampshire. The males and females had not been separated so they continued to breed. The animals have been signed over to the RSPCA to be cared for at one of the charity's centres. They are asking for donations of food and bedding. RSPCA Inspector Mick Garrity said: "There were containers and gerbils absolutely everywhere. "The hallway was full and there were about 35 containers in the bathroom alone." 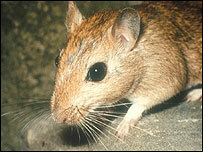 Many of the gerbils were pregnant and some were in a poor state requiring veterinary attention, he added. He said prosecution of the owners is likely.